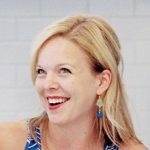 Okay, I’m going to be real. I am craving this lemon loaf cake almost every single day that I am not actually having it, which sadly is most days. 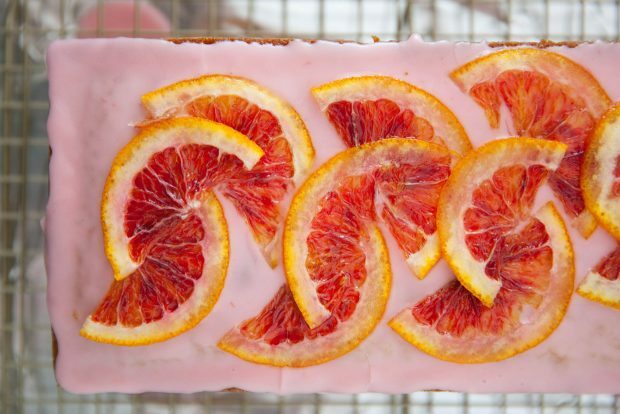 Recently I was craving it while also thinking about the beauty of blood oranges (as we all do at some point during the day, right? Anyone? Bueller?) and it hit me. Combine the two. Best of both worlds. 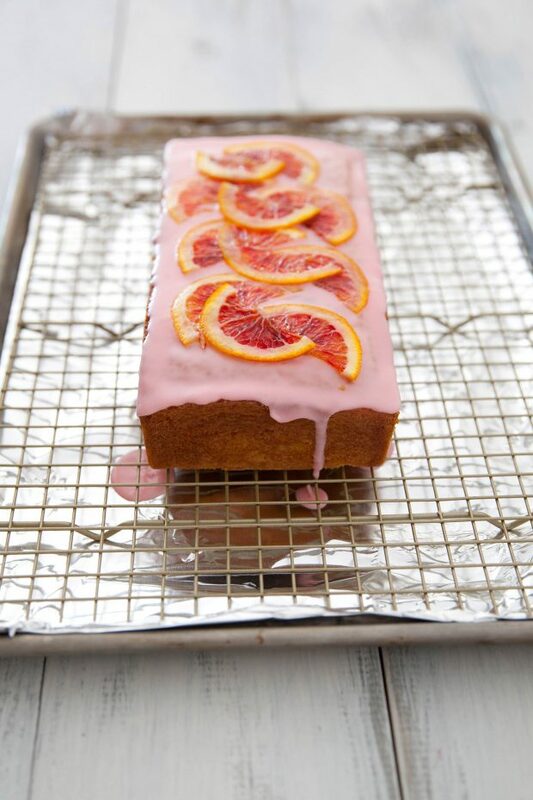 Blood orange loaf cake. 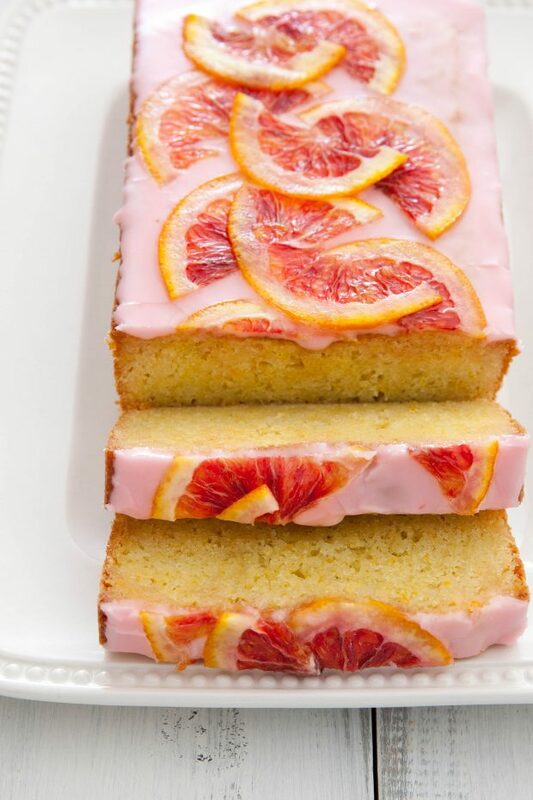 I love this cake because of its simple elegance, and the intense orange flavor that comes from three doses of orange – in the cake itself, the soaking syrup and the glaze. Even more if you add the candied orange slices on top. My kids…well, they just love it because of the pink icing. Who am I kidding? I love that too. To make the cake, preheat the oven to 350˚ F. Grease and flour a 9 x 5-inch loaf pan. In a medium bowl, combine the flours, baking powder, baking soda and salt. Whisk to blend and set aside. In the bowl of an electric mixer, combine the sugar, eggs, orange zest and orange juice. With the mixer on low speed, blend in the melted butter. On low speed, mix in half of the dry ingredients just until incorporated. Beat in the sour cream and vanilla until combined. Mix in the remaining dry ingredients, again just until incorporated. Transfer the batter to the prepared pan. Bake 20 minutes, then rotate the pan and reduce the oven temperature to 325˚ F. Continue baking 30-35 minutes or until a toothpick inserted in the center comes out clean. Let cool in the pan at least 15-20 minutes. Turn the cake out of the pan and transfer to a wire rack set over a baking sheet. To make the orange syrup, combine the sugar and orange juice in a small saucepan over medium heat, cooking just until the sugar is completely dissolved. Poke the top of the warm cake all over with a toothpick or skewer and pour the orange syrup over the top. To make the candied orange slices, wash and dry the orange thoroughly. Cut the orange in half lengthwise, then use a sharp serrated knife to make very thin slices of orange. Poke out any seeds in the slices with a toothpick. Combine the sugar and water in a medium saucepan over medium-high heat. Heat the mixture until the sugar dissolves. Add the orange slices to the mixture so that they are in a single layer (none overlapping), reduce the heat to medium-low and let simmer about 20 minutes, turning the slices at least once so both sides are candied. Remove from the heat. Store in a container with the syrup until ready to use.